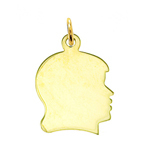 For an unforgettable keepsake any mother would love this lovely 14K Gold Baby Girl Plate Charm. 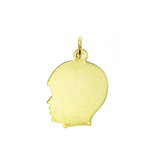 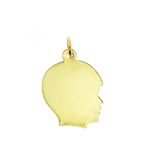 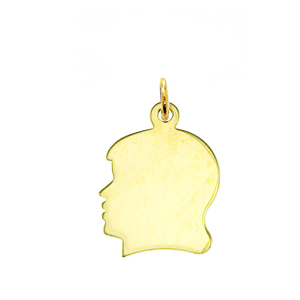 The silhouette of a young girl's face is cast in shining 14k gold for a glittering addition to a gold charm bracelet with a smooth surface perfect for having your own personalized sentiments engraved into the golden surface. 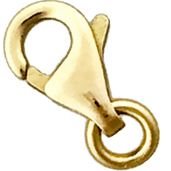 Charm is crafted in 14k yellow gold featuring a polished finish with flat back, it measures approximately (11mm - 3/8") in width by (14mm - 1/2") in height and weighs 1.6 grams, it is a good size for charm bracelet or on a necklace.